Describe Leslie and Wesley. Who are they as people? Do they see each other for who they truly are? Do they like each other as people? Why does Leslie call herself "the last original wife?" Is she proud of this designation? Does it propel her to continue her situation? What impact does her friends' divorces have on her own life and outlook? Leslie tells the psychiatrist, Dr. Katz, "Wes's friends were married to girls who are young enough to be their daughters. I didn't want to spend every holiday and weekend for the rest of my life with a bunch of Barbies. . . . These insipid young women would never be my friends. Moreover, I didn't want them to be my friends." Even though she doesn't have much in common with these younger women, should Leslie have tried to give them a chance? Is being friendly with a new, younger wife a sign of disloyalty? Leslie and Wes have two adult children. Talk about their relationship with their kids. What kind of parents are they? Did they raise their daughter and son well? One of the most important people in Leslie's life is her brother, Harlan. Why did she allow herself to be separated from him for so long? What does Harlan bring to her life that is lacking in Atlanta? What happens to Les emotionally when she heads to Charleston to see Harlan? Why is Charleston important to her? While she's in Charleston, Leslie learns a great deal about Josephine Pinckney. How does Miss Pinckney inspire Leslie? Being in Charleston, Les is reunited with her first love, Jonathan. Compare him with Wes. What does Jonathan provide Les that Wes does not? Do you think she and Jonathan will live happily ever after? Wes and his friends are all in late middle age. Do you think that younger generations of men will be different? How does Wes see himself and his friends? Have their financial achievements given them a false sense of security about their lives? What do you think will happen to Wes? 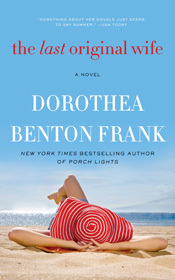 If you've read other books by Dorothea Benton Frank, how does The Last Original Wife compare with them?